How to make carbonated cocktails using a soda siphon! Everyone loves a bit of bubble in their cocktail, but sodas can be sugary and high in calories. What if you could take and entire cocktail and carbonate it yourself with a soda siphon? What endless possibilities would you come up with? Read the next few steps and let us know what you come up with by tagging your Instagram pic with #CliqueShots! 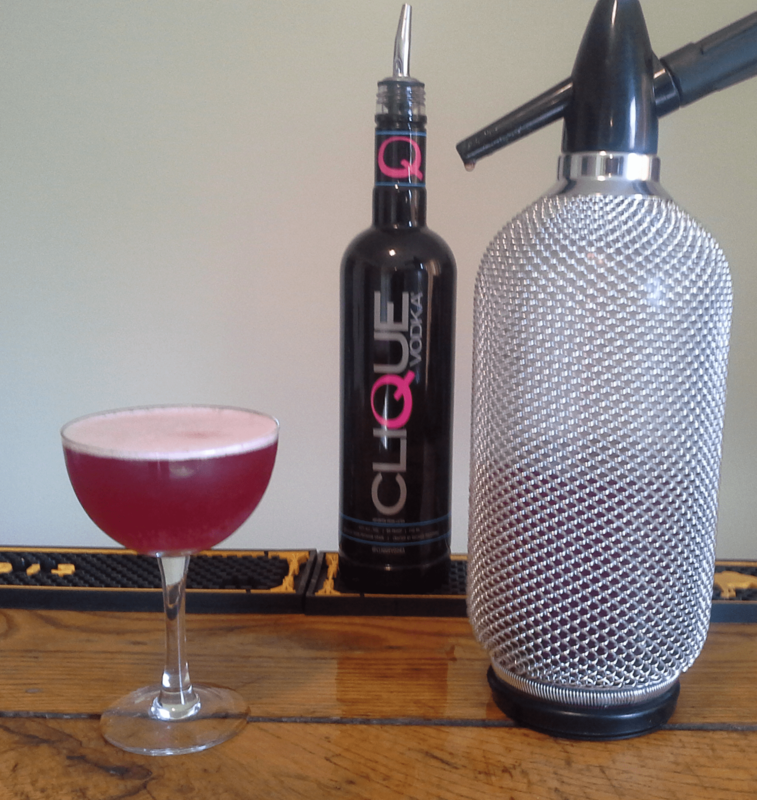 Clique Vodka, a soda siphon, C02 charger, and whatever else you want in your cocktail! Today we’re making a very balanced cocktail containing: Clique Vodka, cranberry juice, lemon and raspberry hibiscus syrup (See below for recipe!)! 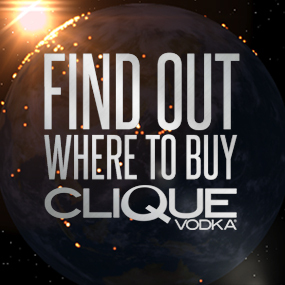 First add the Clique Vodka. 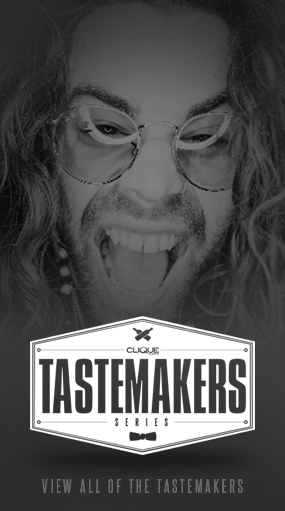 For this recipe, everything is in proportion- starting with our 1 part (or 1 cup) of Clique Vodka. For the mixer portion we will multiply that by three- giving us 3 cups of cranberry juice. For the sweetener and the acid- they should always be the same- so 1/2 cup of each. Funnel them all into the clean soda siphon, and if you’re using a 1L bottle you’ll end up with the perfect amount! Insert the tube with the rubber stopper on the end and screw the lid on tight- and then give it another 1/4 turn tighter just so be safe- we don’t want any cocktail showers on this one! Place a Co2 cartridge in the holder and slowly screw it on. As soon as you hear the cartridge puncture, the Co2 will rush into the bottle. As soon as the hiss dies down, unscrew the casing on the cartridge, remove it and throw it out. Leaving an empty cartridge in the holster can cause rusting, so always make sure you get rid of it as soon as possible. Shake the bottle very well for about a minute, then stash in the fridge for 3-4 hours to chill and let the Co2 work it’s magic. When you’re batched cocktail is ready, slowly pull the handle, letting the contents out into a cocktail glass or into a glass with ice. However you decide to enjoy your carbonated cocktails- make sure you toast to a job well done! *For the Raspberry Hibiscus Syrup: Steep 6 raspberry hibiscus tea bags in 1 1/4 cups of very hot water for 10 minutes. Strain the tea bags, squeezing any remaining liquid out and stir in 1 cup sugar until fully dissolved. Let cool and store in the fridge for up to two weeks. functioning of the lower legs and feet. It can really show off the growing fun loving family. You got a very nice recipe and the perfect ingredients up there. But honestly, start using a decent soda siphon like this one. Concerning imagined human hair https://www.youtube.com/watch?v=nzKvFjXjDXE to have a while, however they used to be option of my very own price structure. During the past year I really last of all got my primary match ( timeless upright ,grey) for the purpose of Yuletide, and i also was enthralled. Currently I can watch for my best upcoming try. They’re just my best couple of winter time Brazilian Virgin Hair https://www.youtube.com/watch?v=GM1xVsMh-dE. Christ will be the finest.